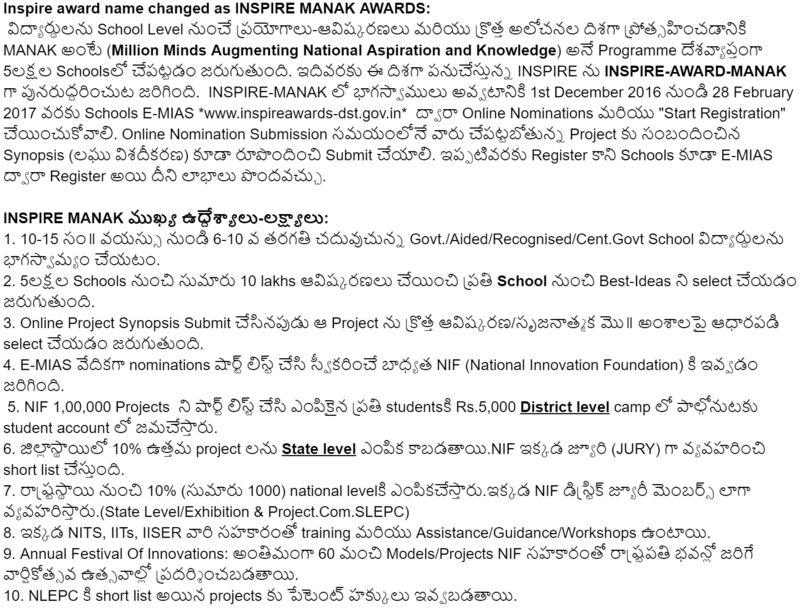 Sub:- SCERT, A.P - INSPIRE Award MANAK - Opening of online system for receipt of nominations extended up to 15.08.2017 - Submissionof nominations for the year 2017-18 - Orders - Issued - Regarding. Ref:- 1.Procds. Rc.No.39/B/lnspire/SCERT 12017of Director,SCERT.Dt: .04.2017. 2.Lr.Rc.No.12011/71/2015 - INSPIRE, Joint Secretory, Ministry of Science ft Technology, Department of Science ft Technology, Govt of India, New Delhi, Dated 30.06.2017, Department of Mathematics & Science. All the District Educational Officers are informed that the Joint secretary, Department of Science ft Technology, Ministry of Science ft Techonology, Government of India, New Delhi has informed that the dead line for receipt of online nominations of INSPIRE Award - MANAK has been extended to 15.08.2017 for the year 2017-18. Hence all the District Educational Officers are requested to apprise the school Authorities of Upper Primary and High Schools of all managements, who did not submit the nominations for 2016-17, suitably so that they can nominate their students. They should note that the date for receipt of nominations shall not be further extended. They are further requested to issue necessary instructions to District Science Officers to take up the work seriously and see that nominations should be submitted by all Upper Primary Schools and High Schools of all managements. They should bestow their personal attention in this matter and take necessarusteps to identify the unregisteres schools and expedite registration of all schools and submission of nominations and also monitor the progress time to time. They are directed to give wide publicity in this regard. Note: The submission of Project synopsis( in word or PDF format) is mandatory along with submission of online nominations.